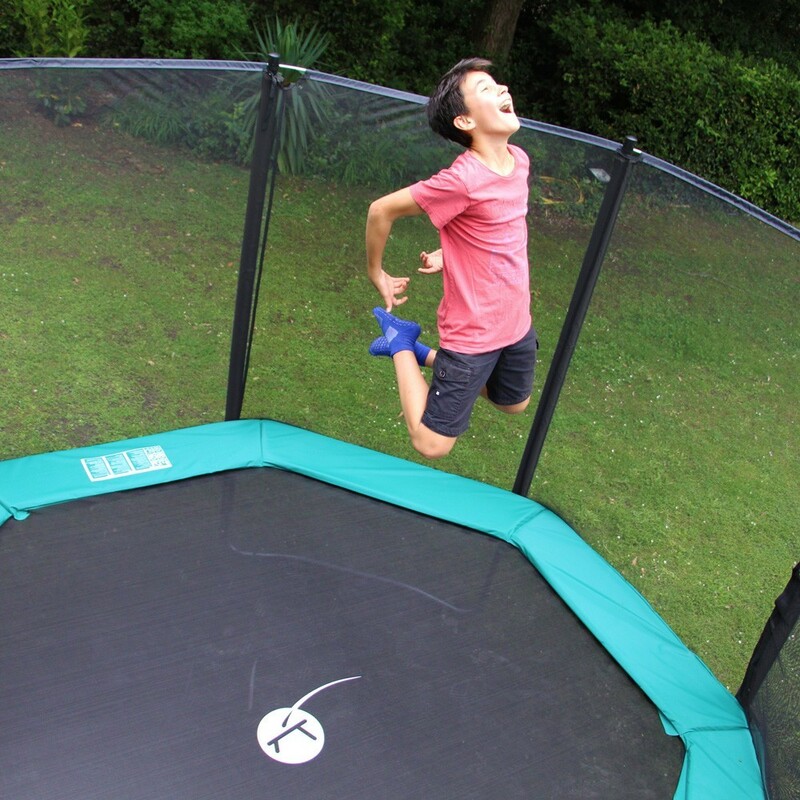 The 14ft Waouuh 430 trampoline is a high-quality product. 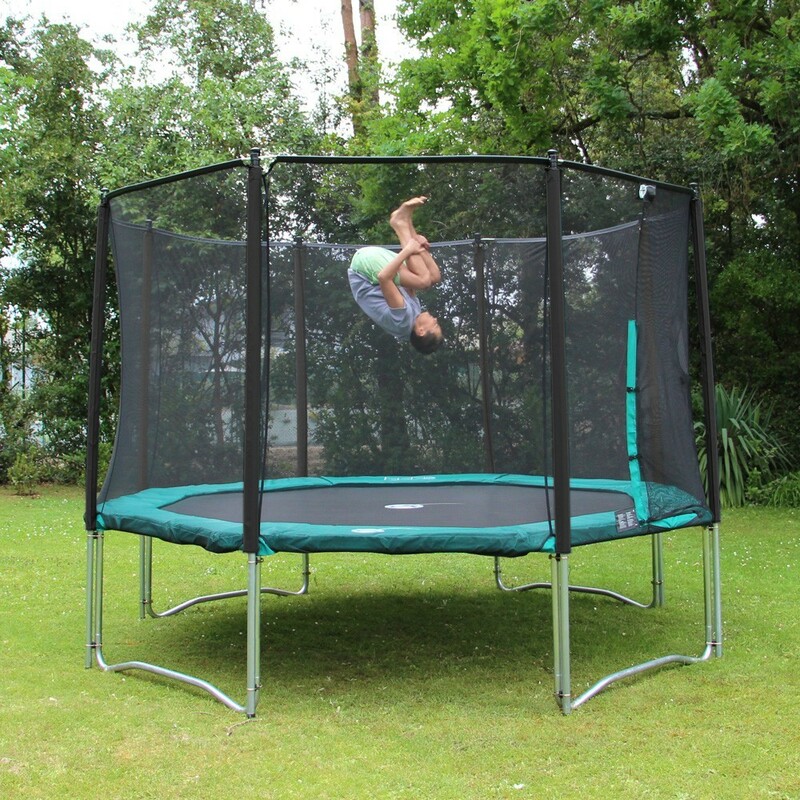 Delivered with a premium safety enclosure, a ladder, an anchor kit and a premium protective cover it will appeal to teenagers and adults alike, looking for dynamic, ample jumps. 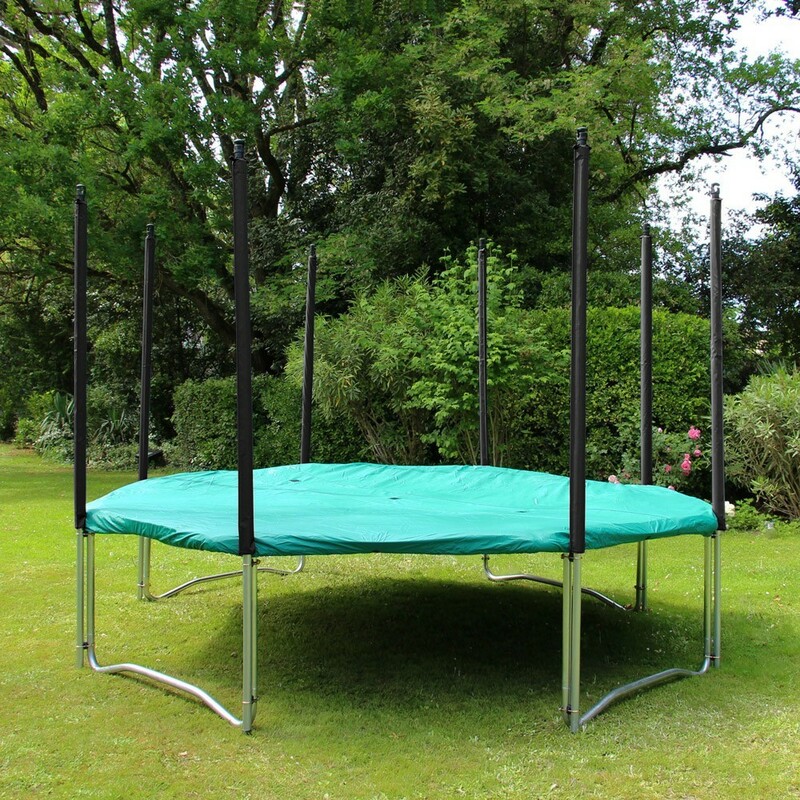 - The octagonal galvanized steel frame is protected against corrosion and you can be left outdoors all year round. 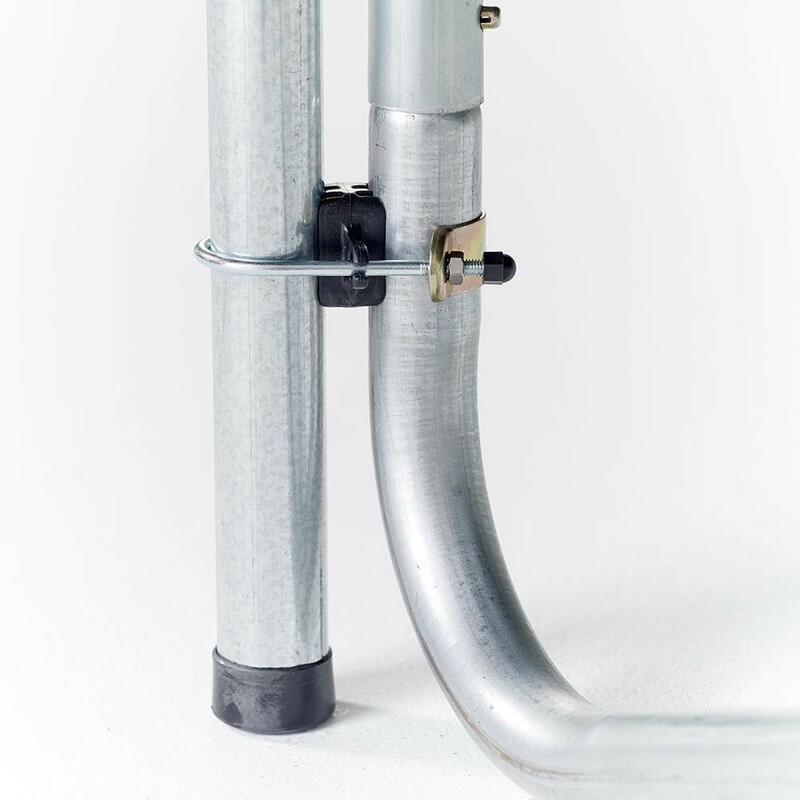 - The 48 mm wide and 2 mm thick framework is joined together using T-junction components. 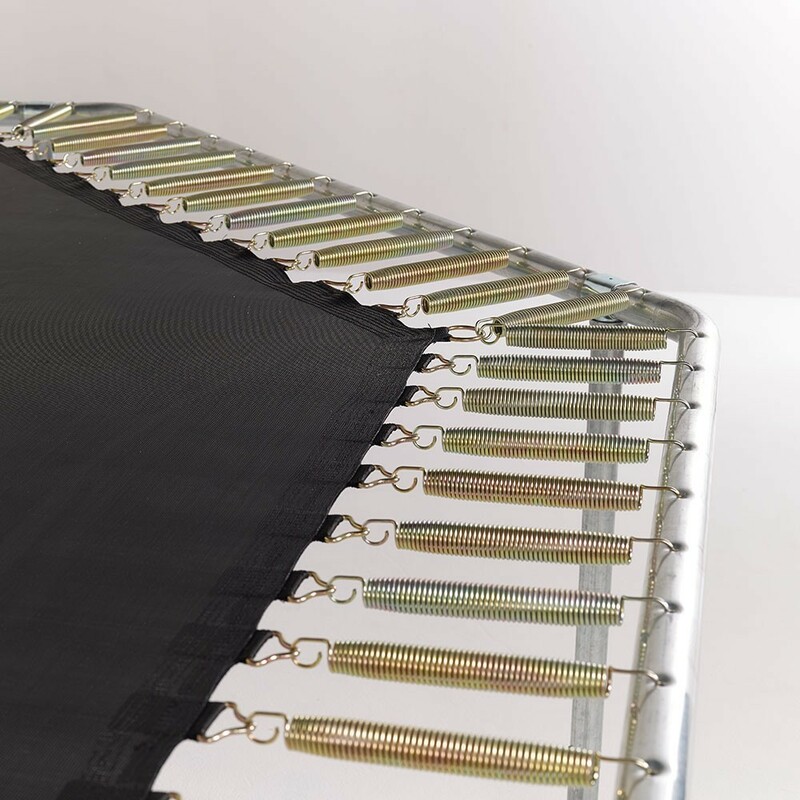 This system is used on almost all of our trampolines and allows us to provide robust and long-lasting structures. 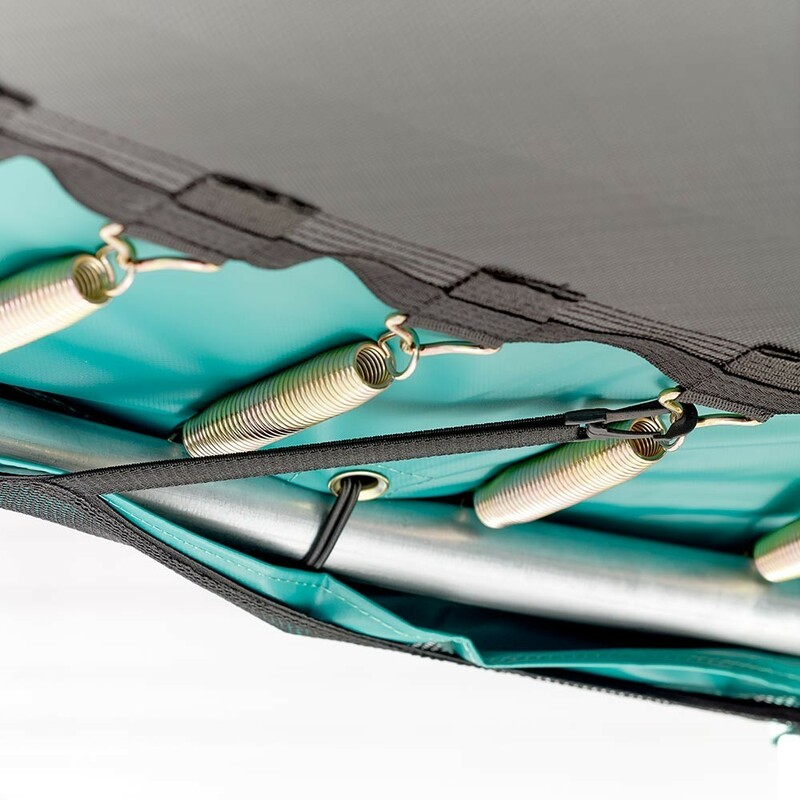 - The high density, UV protected jumping mat has been strengthened using 8 rows of stitches and an extra reinforcement strap. 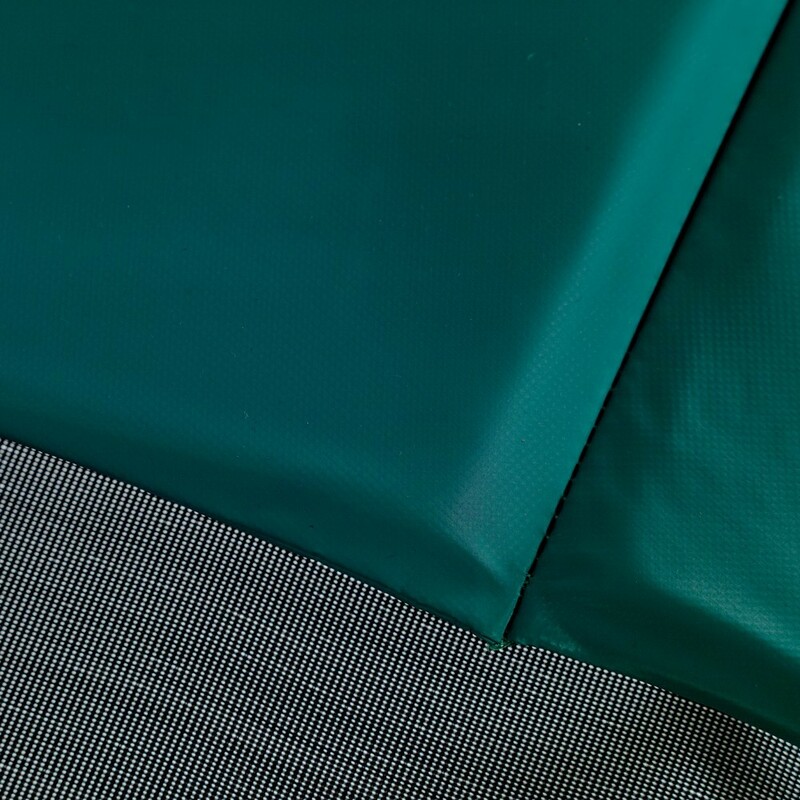 - The frame pad made from 31 mm thick EPE mono-block foam, is covered in a green, waterproof, PVC coated fabric, similar to a lorry tarpaulin. 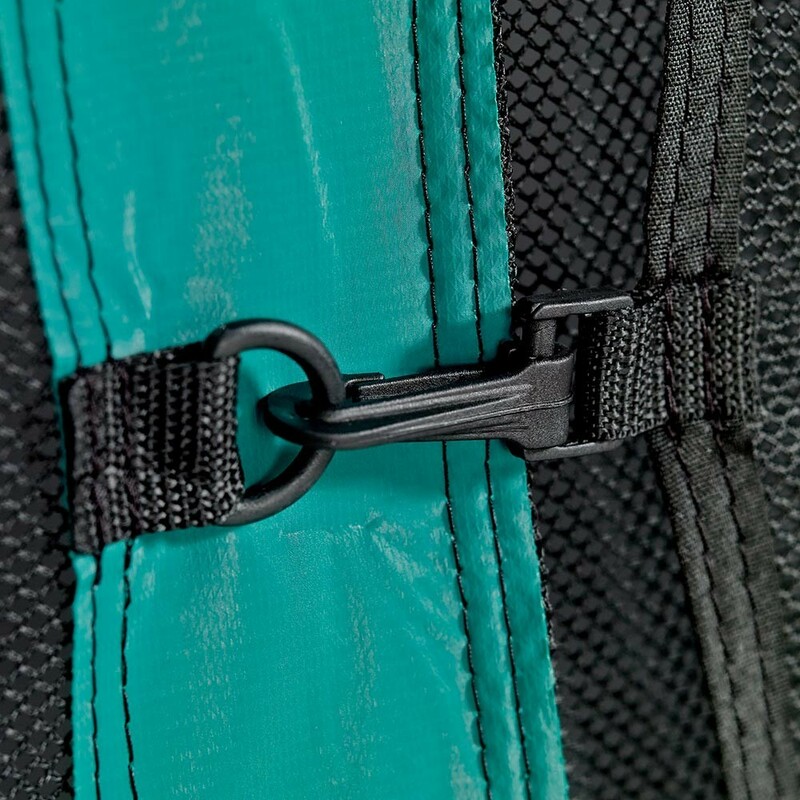 - Jumpers are also protected by the premium enclosure made from polyester. 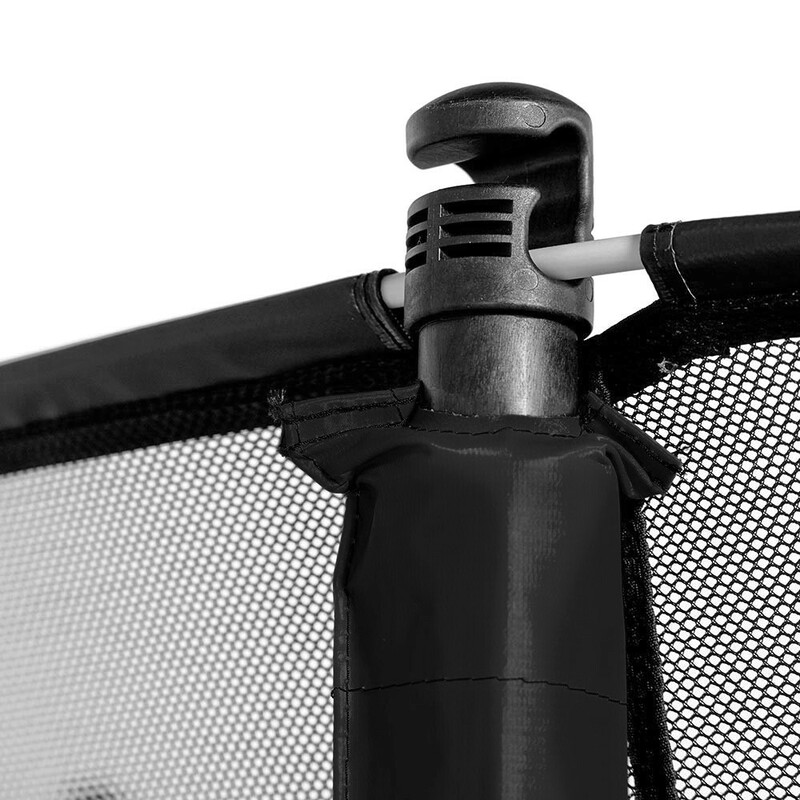 It has an overlapping entrance, thanks to two layers of netting. 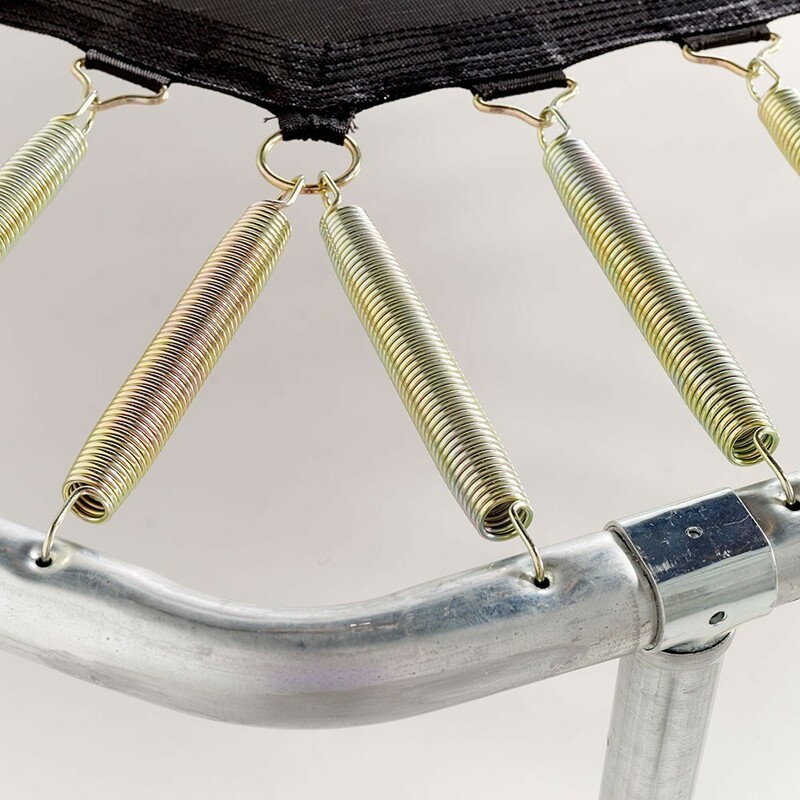 The whole structure is held up using steel posts of 38 mm in diameter, they are among the largest on the market and are held in place using 2 fixation points for added safety. 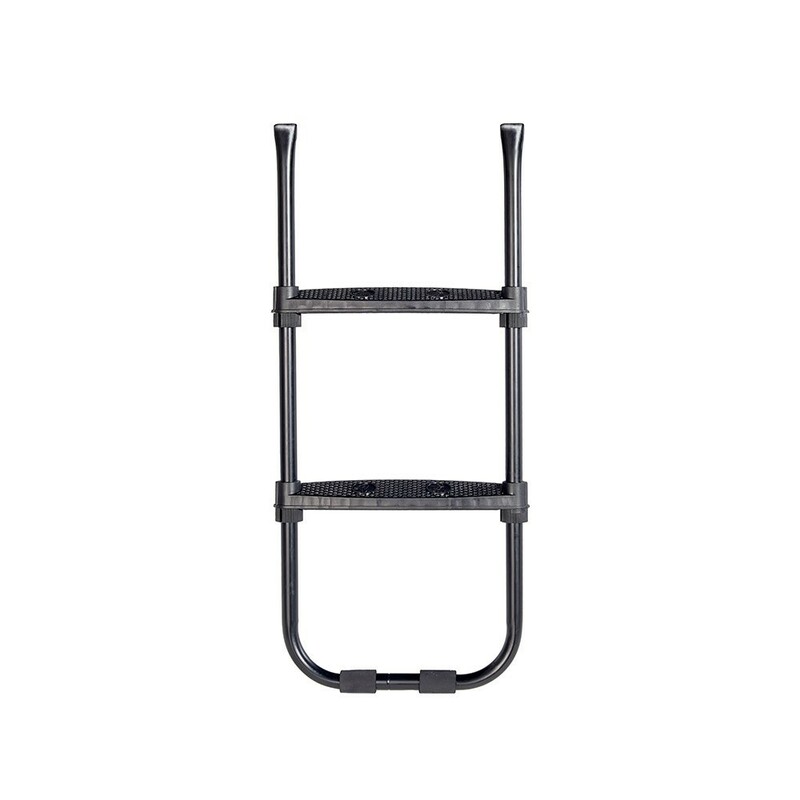 - This pack also comes with a ladder with 2, 7.5 cm wide, anti-slip steps to improve access for children. 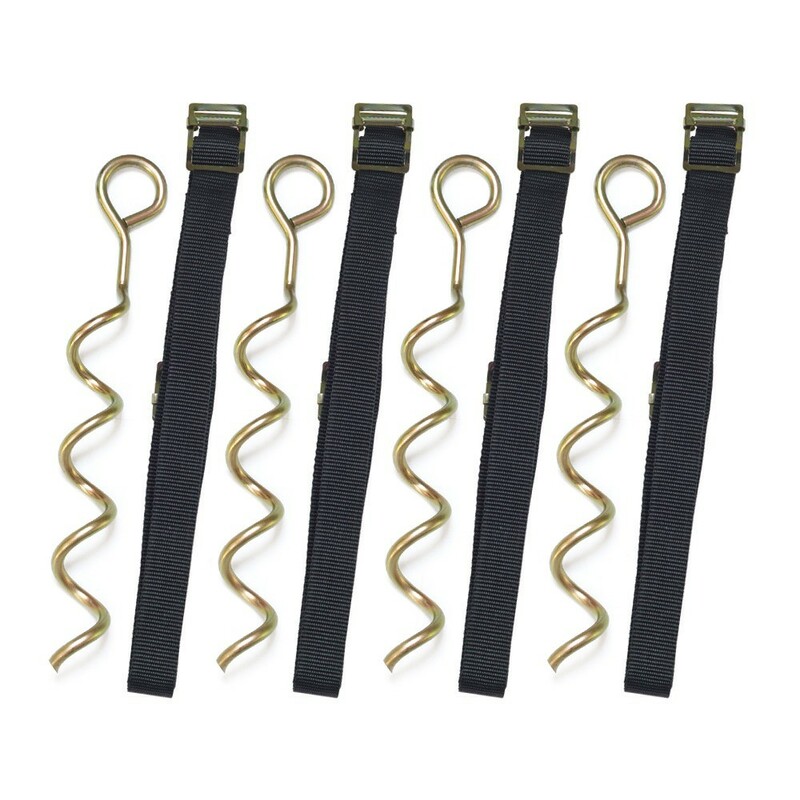 - The anchor kit, essential is windy areas, is provided with 4 winged screws and straps. 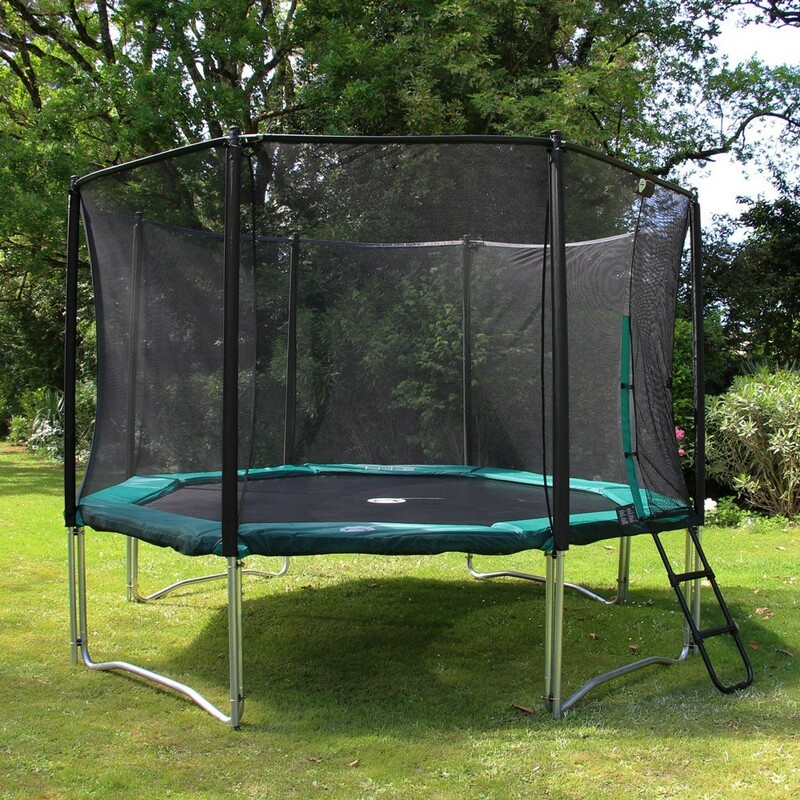 - Our premium protective cover will help protect your trampoline from bad weather conditions, dead leaves and general dust and dirt. 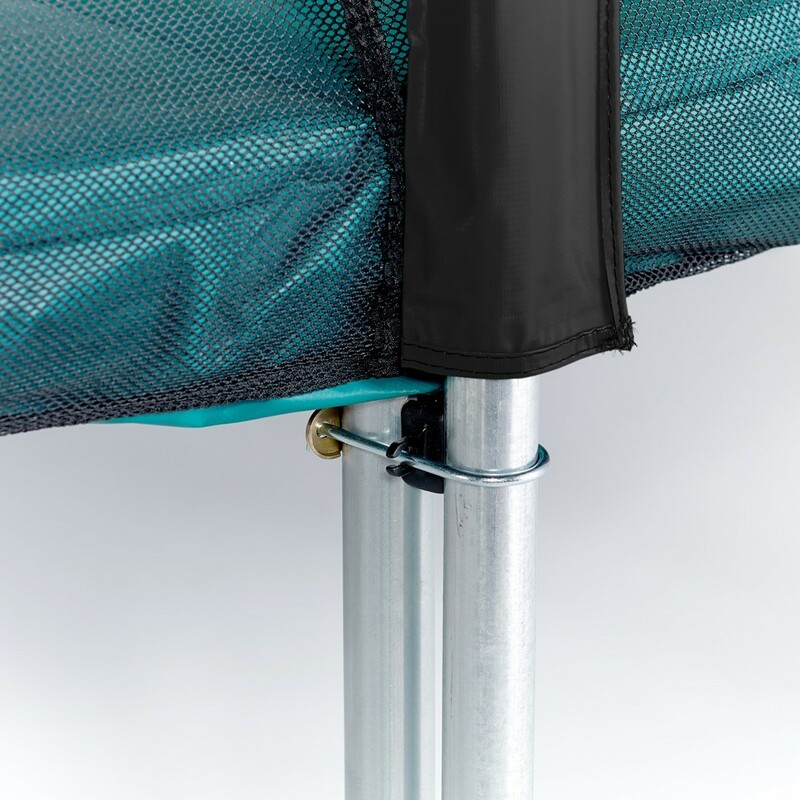 Using this cover will prolong the life of your trampoline. 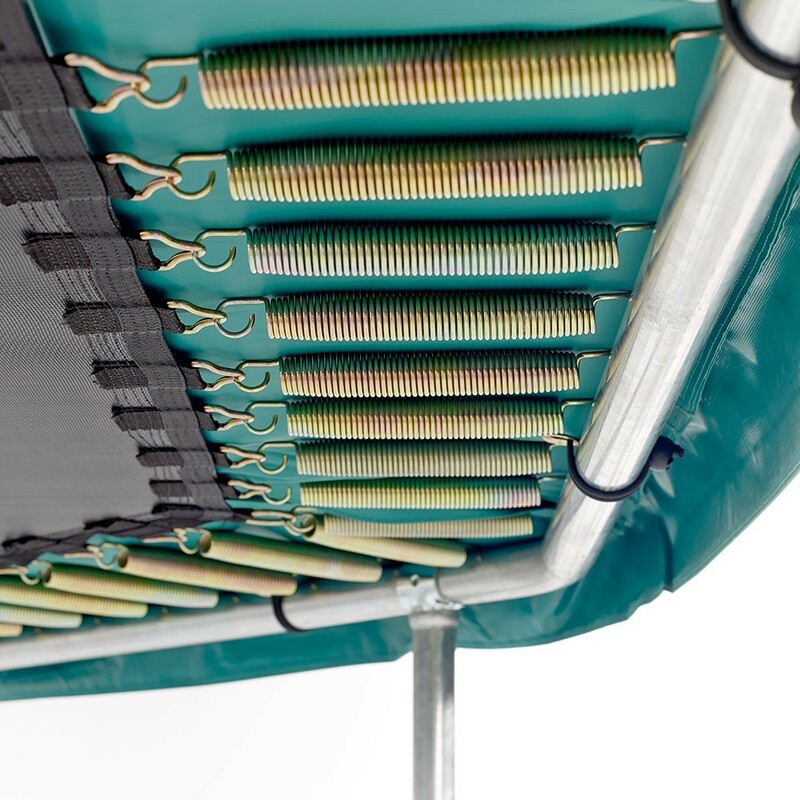 The cover is equipped with 3 evcauation grids to avoid water from pooling in the centre. 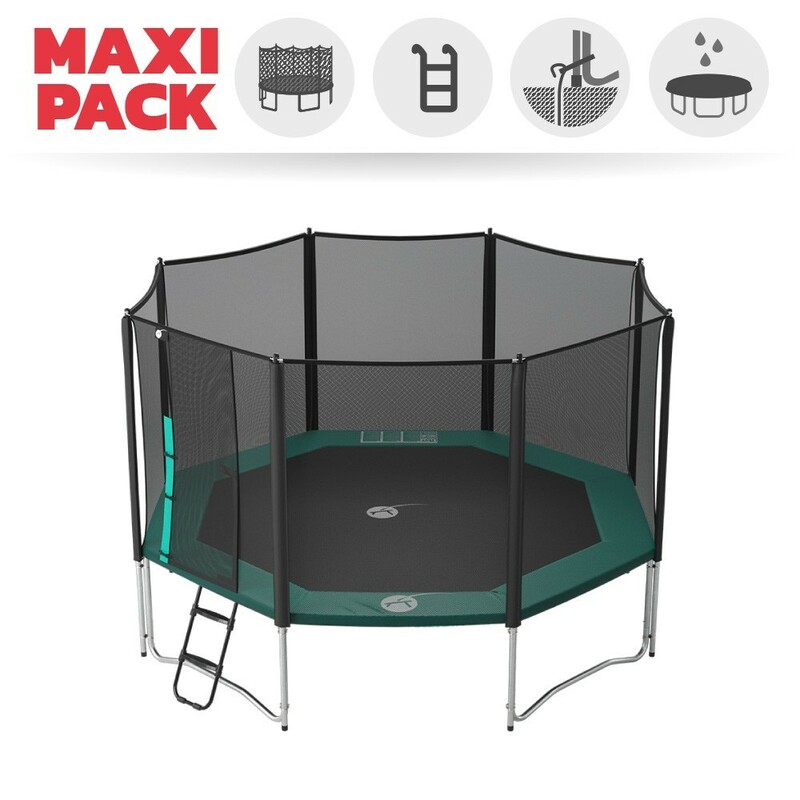 Bonne taille pour se faire plaisir . 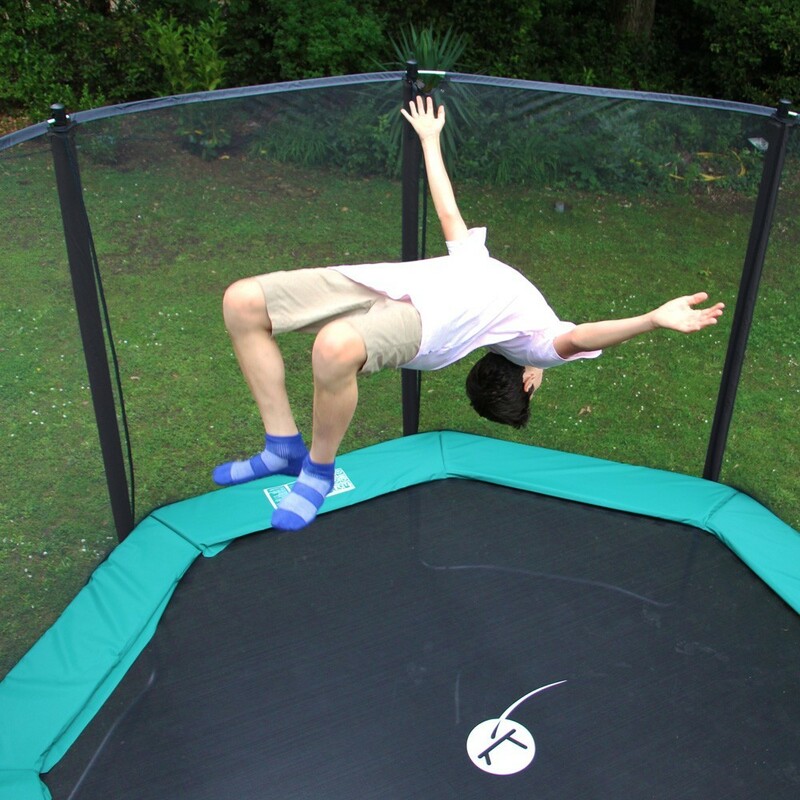 Notre fils est ravi . 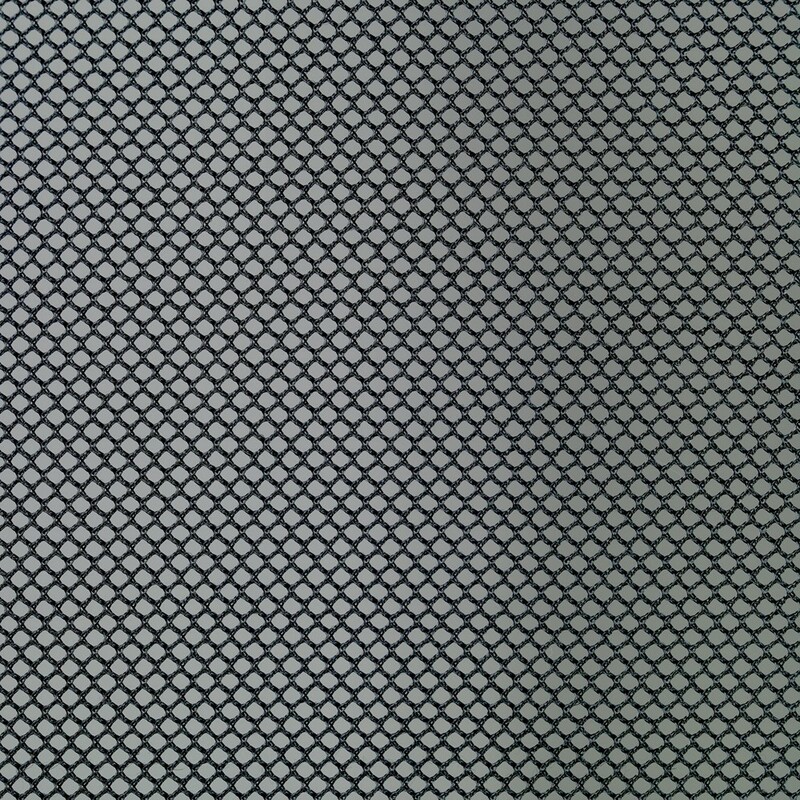 Montage relativement facile mais pas aussi rapide que décrit dans les vidéos . 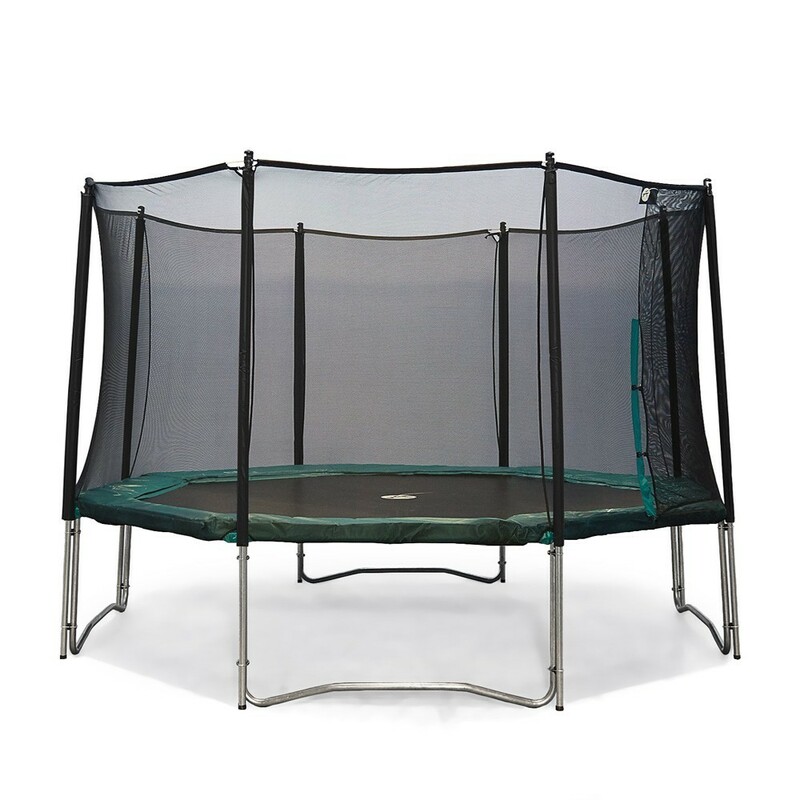 Trampoline impressionnant (430) avec des matériaux d' une remarquable qualité. 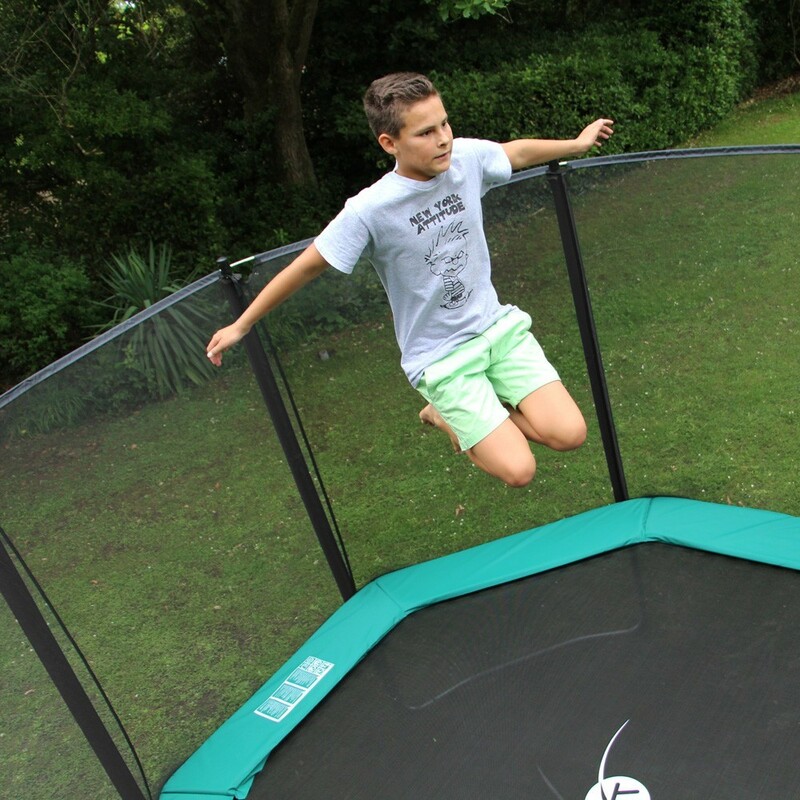 Un véritable investissement à long-terme et en sécurité pour les loisirs de la famille.